Sunrooms are a place for comfort, relaxation, and reflection. Whether you’re an avid reader or just need a place to wind down with a glass of wine at the end of the day, creating your utopia can be a fun process. This recent redo by John Ishmael and I provides an updated, inviting space that is now a favorite room of the house. What was once a room forgotten is now a cozy destination. The large Palladian window was too exposed, providing unwarranted attention. We also decided to take out the bulky sofa and replace it with our client’s chairs borrowed from another room. 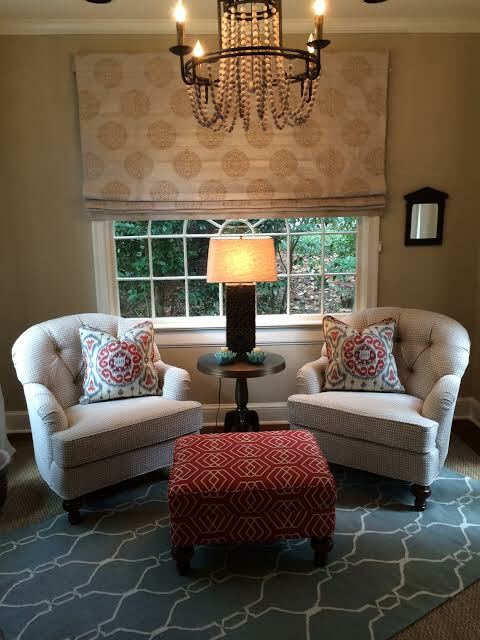 Our custom workroom reupholstered the chairs and ottoman, and we brought in a side table and lamp for a cozier feel. A neutral roman shade adds a little more privacy, and a new chandelier replaces the dated fan. By adding pops of color with the rug and cheery pillows, the client’s sense of style shines through and truly creates a welcoming space. If you like this look, let us create your haven! Come see John and I today and let us makeover your space!